In recent years the National Gallery of Art has significantly expanded its collection of photographs. Although the Gallery began actively acquiring photographs in 1990, the collection initially consisted primarily of the art of a few key twentieth-century American photographers: Alfred Stieglitz, Paul Strand, Ansel Adams, Walker Evans, Robert Frank, and Harry Callahan. Since 1995 the museum has been adding photographs from a much broader spectrum and now has more than 9,000 nineteenth- and twentieth-century photographs in the collection, by more than 250 European and American photographers. 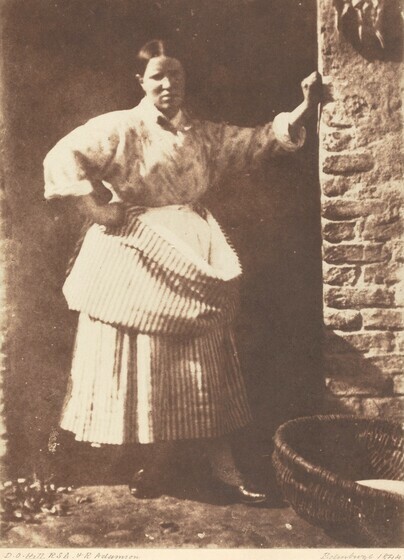 This tour, drawn entirely from the Gallery's collection and from promised gifts, celebrates some of those recent additions, including works by pioneer photographer William Henry Fox Talbot, celebrated nineteenth-century master Julia Margaret Cameron, modernist artists such as Charles Sheeler and László Moholy-Nagy, as well as such observers of modern life as Bill Brandt. The works presented here demonstrate that the most gifted photographers do not simply record their world but transform it, endowing it with meaning and significance; that through selection and manipulation, framing, isolating, freezing, and distorting these practitioners create images that resonate not only with their own emotions or ideas, but also with those of the viewer. Since the discovery of photography in 1839, the practitioners of the new art form invented and experimented with many processes and techniques. The descriptions listed here are a selection of the processes displayed in this tour. Paper negatives were made of fine writing paper sensitized with silver salts, exposed in a camera, developed, and fixed (stabilized). Invented by William Henry Fox Talbot, paper negatives were used exclusively until the late 1840s. A paper negative could be used for the printing of a positive salted paper print by placing it on top of a sheet of paper sensitized with silver salts and exposing it to sunlight. Papers could be sized with starches such as arrowroot to enhance the appearance. Salted paper prints are characterized by a matte surface and a soft, atmospheric quality resulting from the texture of the paper negative. Because of their increased translucency, waxed-paper negatives, especially popular in Britain and France, allowed for finer detail. Early glass negatives or collodion negatives were hand-coated with a thin film of collodion (guncotton dissolved in ether and alcohol), then sensitized with silver salts. The plates were exposed while still wet and developed immediately. Popular throughout the 1850s, collodion negatives almost entirely replaced paper negatives by 1860. Glass negatives were ideal for printing albumen prints, the most common photographic print process from the mid-1850s through the 1880s. 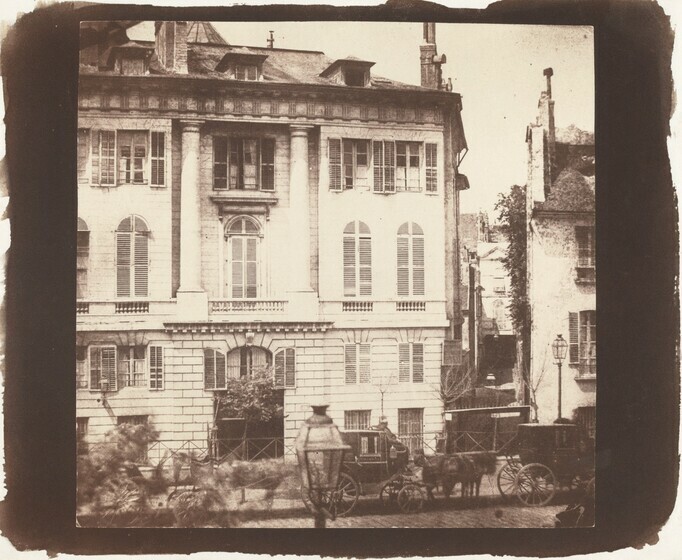 Invented by Louis Désiré Banquart-Evrard, albumen prints were made using paper coated with a layer of silver salts suspended in egg white and then exposed to sunlight through a negative. Albumen prints are characterized by their smooth, glossy surface and fine detail. Most albumen prints were toned with a solution containing gold chloride, which changed the image hue from reddish-brown to a rich purple. The platinum process is based on the light-sensitive characteristics of iron salts, which react with platinum salts to form platinum metal. While in many other kinds of photographic prints the metal image rests within a binder on the surface of a coated paper, here it is absorbed into the fibers. Thus the image takes on the texture of the paper and is softer in appearance and less detailed than a photographic print on a coated paper. Prized for its rich blacks and delicate tonal range, platinum is usually charcoal in hue, although the hue may be changed by varying the temperature of the developing solution or by using toners such as mercury or gold. Invented and patented by Richard Willis in 1873, the platinum process was popular from the late 1880s through World War I, when it became economically impractical to manufacture the paper commercially. The palladium process is identical to platinum except that salts of palladium are substituted for salts of platinum to form the final palladium image. In general, palladium prints are warmer and more sepia in hue than platinum. Introduced in 1916 as a cheaper substitute for platinum, palladium paper was commercially manufactured until the 1920s. A gelatin silver print is a black-and-white photograph in which the image, consisting of silver metal, is suspended in a gelatin layer. To make a modern gelatin silver print, light-sensitive silver salts are mixed in gelatin and applied to a piece of paper that has been coated with a layer of white pigment also mixed with gelatin (the "baryta layer"). The baryta layer gives the print a smooth, reflective surface and brilliant highlights. The paper is exposed to light through a negative and then "developed out," or made visible, in a chemical reducing solution. This basic chemical process, introduced by Talbot in 1840, has been in use for the last 150 years; since World War I it has been the primary method of printing black-and-white photographs. From the moment Talbot announced his new invention in 1839, the world was entranced with photography. Talbot himself realized that by recording the world around him—a busy street, an architectural detail, or something as simple as light falling on an old building—he could freeze the visual spectacle of the world and create an object that could be savored long after the event had transpired: he could transform life into art. In 1843 the Scottish artist David Octavius Hill embarked on a large commemorative painting of the 400 ministers present at the founding of the Free Church of Scotland. To capture likenesses of all these people, he formed a partnership with a young scientist, Robert Adamson, and learned how to make photographs. 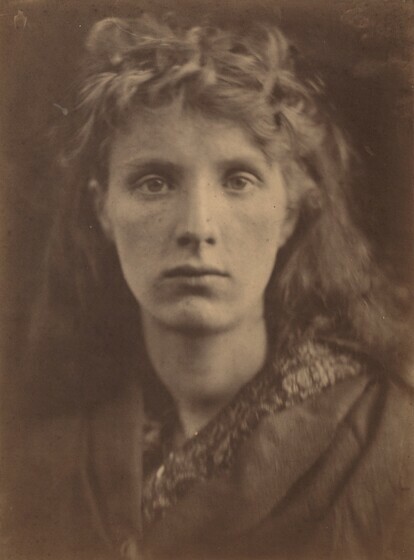 Although the medium had been invented only four years earlier, Adamson's technical skills and Hill's great inventiveness enabled them to create sensitive and highly skillful photographs of Edinburgh's leading citizens. Their simple but often bold compositions made intelligent use of the paper negative process, with its overall softness and suppression of detail. This and the subtle blurring of forms caused by the slight movement of figures during the 20- or 30-second exposures give a relaxed spontaneity to their photographs. Entranced by the seemingly boundless potential of photography, Hill and Adamson in 1844 announced their intention to produce six albums detailing all aspects of Scottish life. The first, Fishermen and Women of Firth of Forth, included photographs made primarily in Newhaven, a small village outside Edinburgh. Hill's and Adamson's photographs celebrate the simple, yet often heroic lives of their subjects. A Newhaven Fisherwoman is further distinguished by its sense of immediacy and the strong, forthright pose of the woman, who directly and confidently meets the viewer's gaze, staring back at us across the span of more than 150 years. Charles Nègre was a highly inventive member of the first generation of French photographers. Praised for his artistic talent, he is also known for both the range of his subject matter and the extent of his ambition. Although he trained as a painter in the studio of Paul Delaroche, he began to make photographs in 1844. During a career of about 20 years he explored every available photographic process of the day: daguerreotypes; paper, waxed-paper, collodion, and even albumen negatives; as well as salted and albumen prints, and photogravure. A consummate printmaker, he fully understood his processes and exploited their potential as an integral part of the meaning and beauty of his images. Nègre was among the first photographers to recognize that a great strength of the medium was its ability to capture a moment in time. In the early 1850s he began making genre scenes, focusing on Parisian street life. 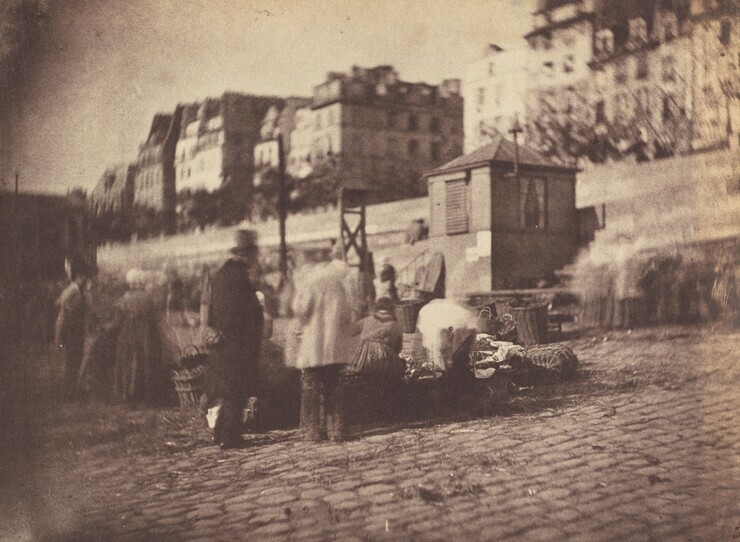 Many of his photographs were posed, but in 1851 he perfected a lens that allowed him to record nearly instantaneous images, such as Market Scene at the Port of the Hotel de Ville, Paris. This photograph was acclaimed at the time for its revolutionary depiction of the natural tableau of daily life, as if caught by the peripheral vision of a passerby. Since the 1950s this print has been frequently reproduced as a seminal example of the early history of photography. One of the most important of all 19th-century photographers, Roger Fenton first trained as a lawyer, then studied painting for several years but without much success. In 1851 he attended the Great Exhibition in London. Like many others, he was fascinated with the photographs he saw there. But he was appalled at the dismal state of British photography, especially in comparison to the art form as practiced in America and France. He took it as his mission to elevate both the quality and the standing of photography in Great Britain. After studying with the renowned French photographer Gustave Le Gray, Fenton began to make photographs himself in late 1851 or early 1852. By the fall of 1852 he had embarked on a bold expedition with the British engineer Charles Vignoles to photograph a bridge that Vignoles was constructing over the Dnieper River in Kiev, then part of Russia. Fenton faced numerous obstacles. He had to transport his bulky equipment hundreds of miles and work in the cold temperatures and dim light of the Russian autumn with a process he had been using for less than a year. That he was able to make any photographs is remarkable; that he was so successful is an indication of his fierce commitment to his art. Moscow, Domes of Churches in the Kremlin is the most accomplished of his photographs from this trip. 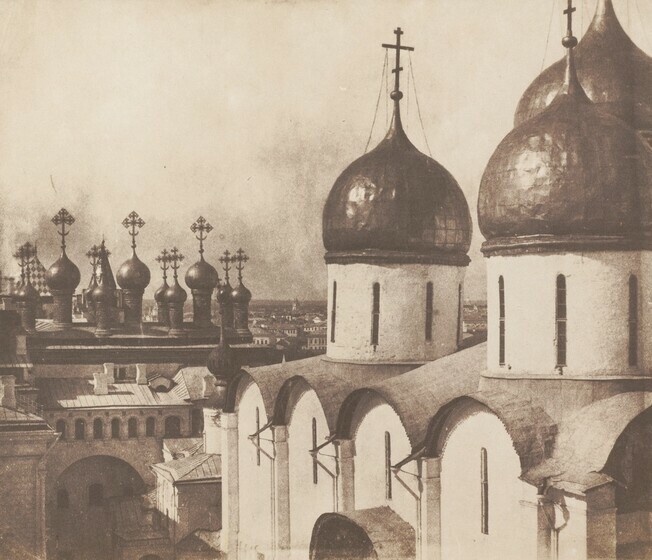 To emphasize the onion-shaped domes, Fenton climbed high up into the cathedral and positioned his camera to capture a sweeping view of the exotic scene. And by using Le Gray's method of waxing his negatives, he was able to suggest the twinkling luminosity of the domes themselves. A founding member of the Liverpool Photographic Society, Francis Frith began to make photographs in the early 1850s. Between 1856 and 1860 he made three trips to the Middle East, traveling extensively by boat, horseback, and caravan throughout Egypt, Palestine, and Syria. Carrying an impressive amount of equipment, Frith used three cameras: one for stereoscopic views, one for 8" x 10" negatives, and one with a mammoth plate for 16" x 20" negatives. Because he used the wet collodion process, he also had to transport fragile glass negatives, chemicals, and a darkroom to coat and develop his plates on site. In addition to struggling with the harsh, hot, and dusty environment, he and his companions had to contend with shipwrecks as well as attacks by bandits and kidnappers. Yet his remarkably masterful photographs belie these difficulties and instead celebrate the architectural wonders of the Middle East. The Ramasseum of El-Kurneh, Thebes, First View was made on his second trip to the region. 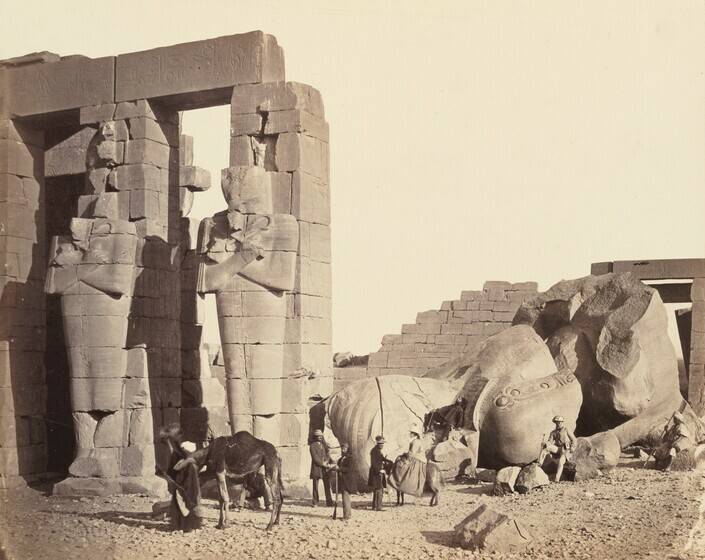 The site of the fallen colossus of Ramses II was a popular stop for Western tourists as they traveled up the Nile. While the figures posing around the monument make clear its enormous size, the man jauntily perched atop Ramses' remains succinctly represents Frith's enthusiastic support of the expansion of the British Empire: "It is an exciting thought that perhaps to England will eventually fall the task of governing this wonderful land and of Christianising its mummied and paralysed life." 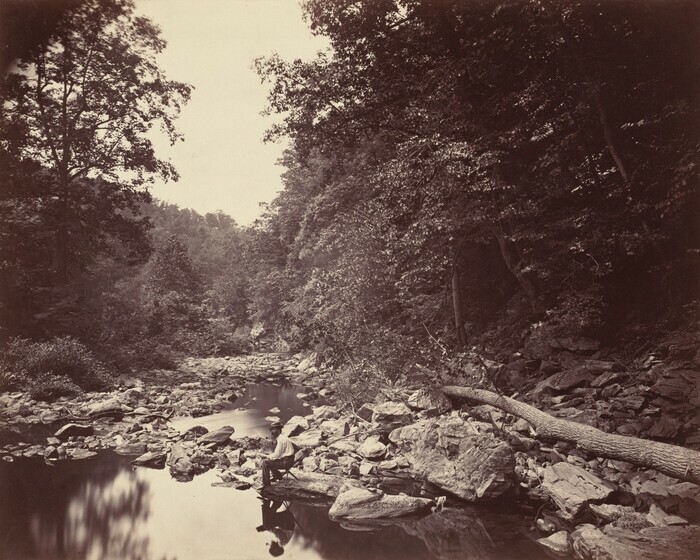 Perhaps as an antidote to the Civil War that ravaged the American landscape and psyche, John Moran made this carefully constructed, idyllic photograph of the Wissahickon Creek, just outside of Philadelphia. He presents an artist, perhaps his brother, the painter Thomas Moran, quietly sketching the beauty of the natural environment. The artist's central position and his reflection, perfectly mirrored in the still pool of water in the foreground, seem to confirm both his importance and his harmony with his surroundings. The ability of the artist to bring order to his world is further suggested by the delicate retouching in the upper left of the photograph to remove the jarring intrusion of a building into this bucolic vista. The New York art dealer Julien Levy, who helped to preserve Atget's work in the late 1920s and early 1930s, once confessed, "there is nothing I could ask for better than to roll myself between sheets of Atgets." Atget was able to capture an almost tactile quality in his photographs. He realized that through careful, quiet observation, unpretentious description, and faithful attention to seemingly small details he could record not just the look of Paris at the turn of the century, but also its feel; not just visual experience, but emotional experience as well. This photograph, with its delicately rendered depiction of leaves and light, succinctly illustrates what Levy lovingly referred to as "the monumental effect [of] nothingness" contained in Atget's work. In 1917 the painter Charles Sheeler created his first—and arguably his most important—series of photographs. In these works he forcefully demonstrated the lessons he had learned from European modern art, especially its emphasis on flat abstract patterning, fragmentation of form, and spatial ambiguity, and he boldly applied them to the medium of photography. Working at night and using a harsh artificial light that cast strong shadows and revealed few details, he created daringly modernist compositions. In addition, as he made clear in his titles which identify where the photographs were taken, he showed how these European ideas about art could be applied to distinctly American subject matter. Although Sheeler was deeply attached to the simple eighteenth-century house in Doylestown, Pennsylvania, where he lived, it was its nineteenth-century stove with which he most identified. He even referred to it as his "companion." Situated in the center of this photograph, the gracefully defined structure has obliterated the more traditional source of heat for the room—the fireplace only barely visible to the left—and radiates what Sheeler described as a "welcome warmth." 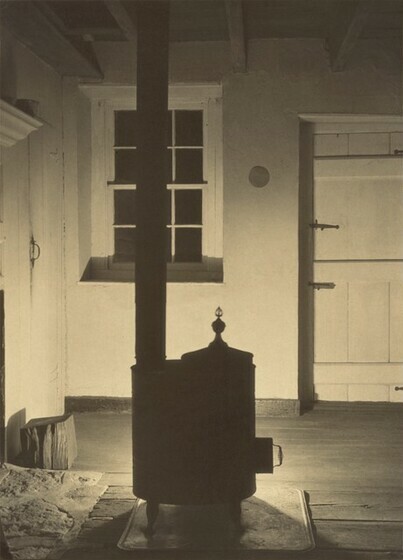 Like Sheeler himself, the stove was a transplant from another era; it was a new object that had found a space and function in an older environment. In this way Sheeler sought to demonstrate how twentieth-century American art and life could draw strength and sustenance from the nation´s cultural history. Born in Boston, Alvin Langdon Coburn began to make photographs in 1898. He studied first with his distant cousin, the eccentric photographer F. Holland Day, and later with Edward Steichen as well as the painter Arthur Wesley Dow. 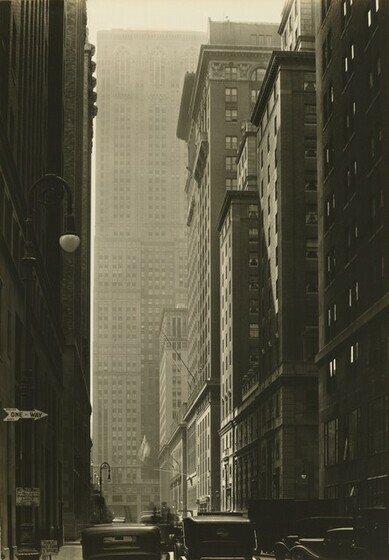 Elected a member of Alfred Stieglitz's Photo-Secession, he quickly achieved renown for his cityscapes of New York, London, and Venice and his portraits of such distinguished figures as George Bernard Shaw, Henry James, and William Butler Yeats. Like many photographers associated with Stieglitz, Coburn by 1910 sought to shed the romanticism of the pictorial movement and bring photography more in step with abstract painting and sculpture. He made photographs looking down from the tops of tall buildings to explore the use of flattened perspective and geometric patterning. During World War I he became involved with the Vorticists, a group of British artists, including Wyndham Lewis and Ezra Pound, who sought to construct a dynamic visual language as abstract as music. After experimenting with multiple exposures, Coburn in 1916 invented a kaleidoscope-like instrument with three mirrors clamped together, which when fitted over the lens of a camera would reflect and fracture the image. 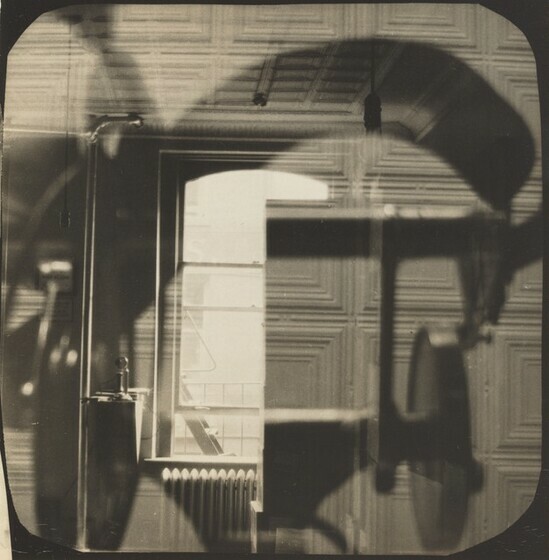 Pound dubbed the device a "Vortescope" and the resulting photographs "Vortographs." When Coburn exhibited 18 Vortographs in London in 1917, with an introduction by Pound, they created a sensation and were debated in the press for several months. 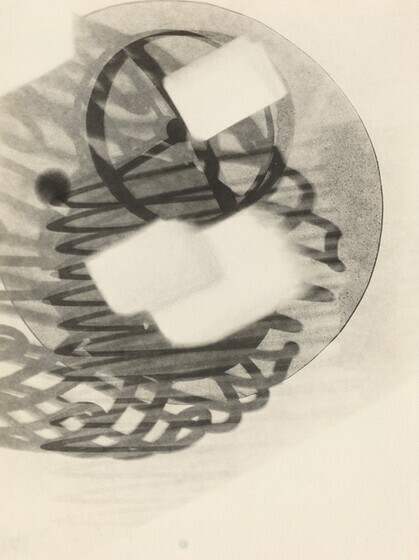 Widely celebrated as the first consciously created abstract photographs, Coburn's Vortographs are exceptionally rare. Many, like this one, appear to exist in only one print. 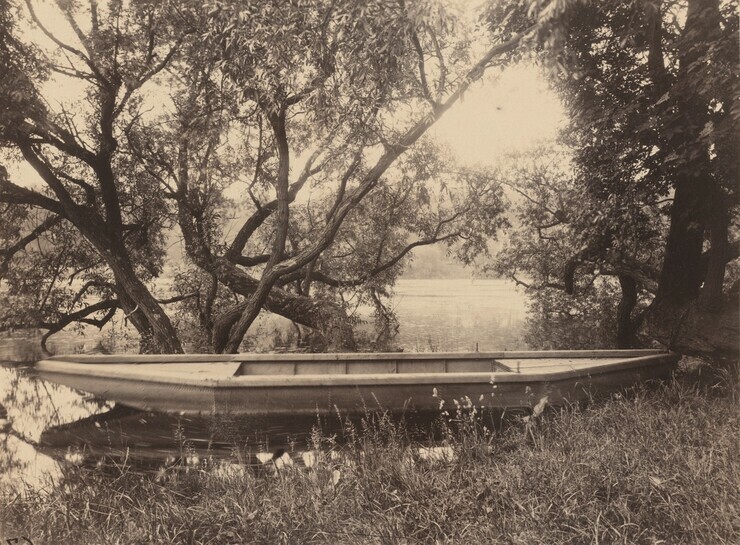 This work, with its dynamic arrangement of forms, succinctly illustrates, as Pound noted, how Coburn's Vortographs leapt beyond the "stale and suburban" style of pictorialism, freed the camera from the representation of reality, and brought photography on a par with modern abstract painting. In the 1920s and 1930s numerous painters and sculptors began to explore photography, using it as just another tool in the artist's repertoire of equipment. With their modernist sensibilities intent on analyzing the fundamental properties of the medium, they often made highly experimental photographs and considered photography as something that could be fabricated. 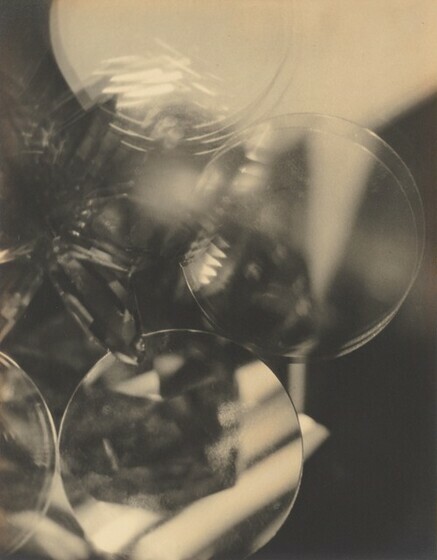 Beginning in the early 1920s, Moholy-Nagy often made prints (called photograms because they were made without using a camera) by placing objects on pieces of light-sensitive paper, which he then exposed to light and developed. Occasionally, as in this work, he placed the resulting "negative" print in contact with another sheet of light-sensitive paper, and exposed and developed it to achieve a "positive" print. Born Marianne Liebe in Chemnitz, Germany, Marianne Brandt studied painting and sculpture in nearby Weimar before entering the Bauhaus in 1923. There she studied with Joseph Albers, Wassily Kandinsky, and Paul Klee, but she was most strongly influenced by László Moholy-Nagy. She subsequently became an assistant professor at the Bauhaus, teaching in the metal workshop. But under Moholy-Nagy's tutelage, she also began to take photographs and make photomontages. She exhibited her photographs throughout the 1920s, most notably at the Film und Foto exhibition in 1929. Brandt's photomontages are larger and more elaborate than those of Moholy-Nagy. As in this work, she often included clippings from newspapers and film magazines as a means of commenting on current social and political events. Here, a reproduction of a famous photograph of Marlene Dietrich waving goodbye to Germany as she set sail on the Bremen for American helps date the work to 1930. (Although Dietrich left Germany to further her career, she recognized the growing Nazi threat and refused all offers to work under the Nazi regime.) 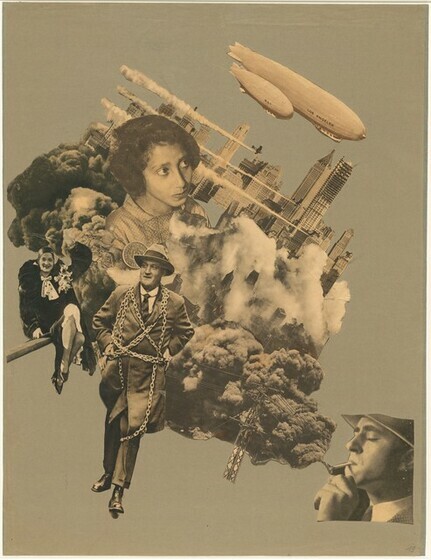 That reproduction along with the ominous imagery of planes flying into New York skyscrapers, an industrialist in chains, and smoke spewing from both a cigarette and a motorcycle make this work a powerful statement on the rising economic and political tensions of the time. During the early 1930s, as the multi-talented Smith moved from cubist painting to collage and on to free-standing sculpture, he also made many photographs. Just as Smith would create a new kind of sculpture by welding, not carving or modeling form, he explored in his photographs a new vision by merging multiple negatives, multiple exposures, and masks. Composed of layer upon layer, sandwiched together so that they seem almost to have three-dimensional depth, Smith's photographs provided him with another arena in which to explore new ways of combining forms, defining space, and using light to reveal structure. Perhaps made in his studio at the Terminal Iron Works in Brooklyn, New York (a machine shop that produced fire escapes), this dense photograph with its pressed-tin ceiling, metal radiator, and other mechanical forms speaks of the urban industrial environment that nurtured Smith during the early years of his career. When Berenice Abbott returned from Paris in 1929 after living there for eight years, she embarked on an ambitious project to document New York City. Although initially she was unable to find outside financial support for the project, her efforts were rewarded in 1935 when the New Deal's Federal Art Project of the Works Progress Administration agreed to sponsor her work, and in 1939, her book Changing New York, a milestone in the history of photography, was published. Vanderbilt Avenue was taken in the first month of the Changing New York project. Although the country was in the depths of the Great Depression at the time, Vanderbilt Avenue, with its buildings perfectly aligned and light glistening on both windows and cars, reflects an optimistic, benevolent, and positive view of America's urban environment. In the 1930s Bill Brandt published a highly acclaimed book that seemed to present candid documents of the urban nightlife of London. In fact, he often posed family, friends, and servants to achieve his desired results. 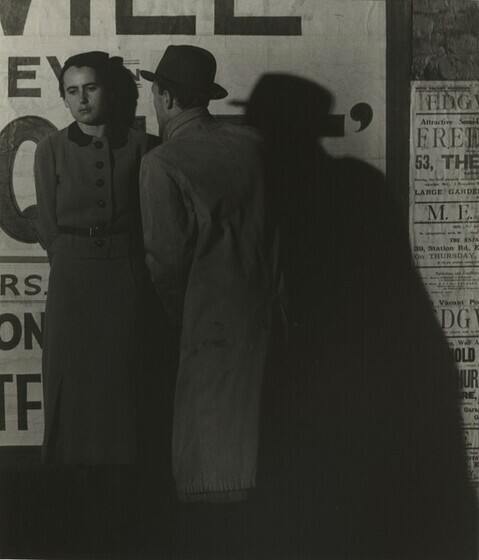 This photograph, for example, does not depict an encounter between strangers on a dark London street, but instead shows Brand's brother and sister-in-law, and the dramatic lighting comes, most likely, not from the street lamps but from large lights set up by Brandt.